In 1949 four Chinese women-drawn together by the shadow of their past-begin meeting in San Francisco to play mah jong, invest in stocks, eat dim sum, and "say" stories. 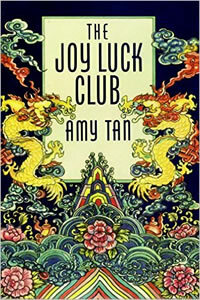 They call their gathering the Joy Luck Club. Nearly forty years later, one of the members has died, and her daughter has come to take her place, only to learn of her mother's lifelong wishâ€”and the tragic way in which it has come true. The revelation of this secret unleashes an urgent need among the women to reach back and remember . . .
"Beautifully written...a jewel of a book." "Powerful...full of magic...you won't be doing anything of importance until you have finished this book." "Wonderful...a significant lesson in what storytelling has to do with memory and inheritance."